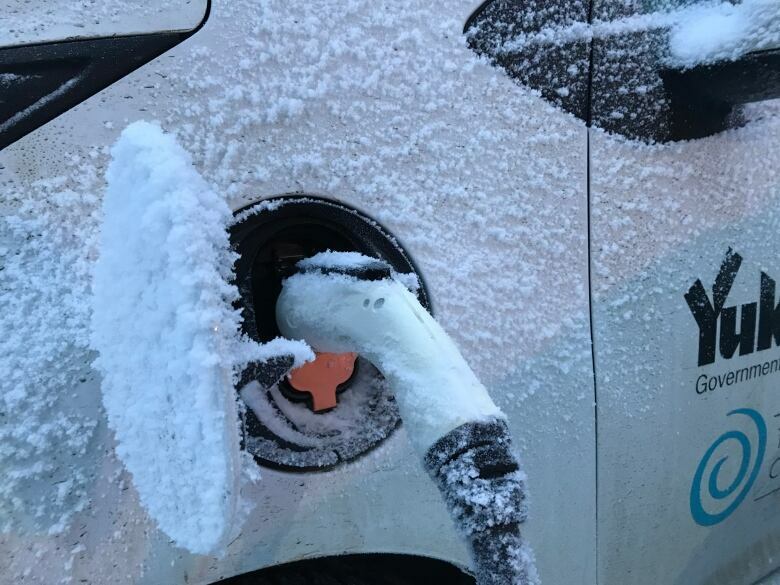 A few electric vehicles are making it through their first Yukon winter. Owners say they're impressed by the cars' performance so far despite the cold. A few electric vehicles are surprising their owners as they navigate their first Yukon winter. 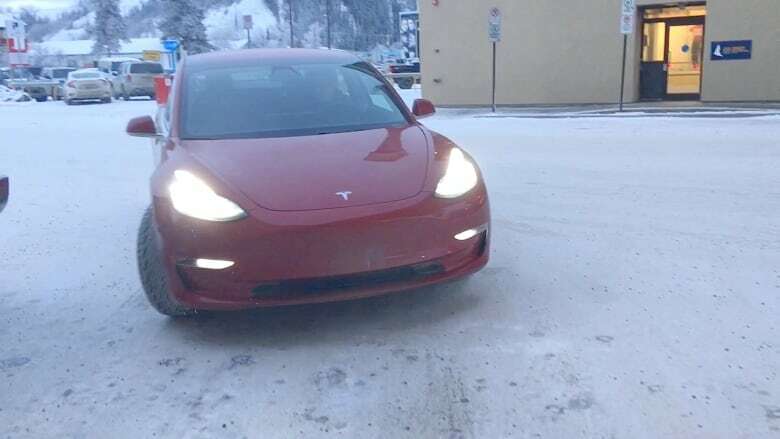 Mike Simon drives the first Tesla Model 3 registered in the territory and said it has performed well so far — even at -39 C.
"I am quite pleased with it," he said. "It has started and it runs in all temperatures. You don't get any ugly engine noises in the morning, it just starts rolling." No dealerships in Yukon sell electric cars. Simon purchased his car last September in Vancouver and drove it to Whitehorse. He said winter conditions seem to reduce the battery range by about a third. "I'd recommend to get a battery that is twice the range of your daily commute just to be on the safe side," he said. That being said, the maximum range on a Tesla Model 3 is just under 500 kilometres. Simon said even the reduced range is plenty for his daily use. "For me, it's more than I need for my daily commute for sure," he said. Simon said he keeps the car in a garage, which helps preserve battery life. 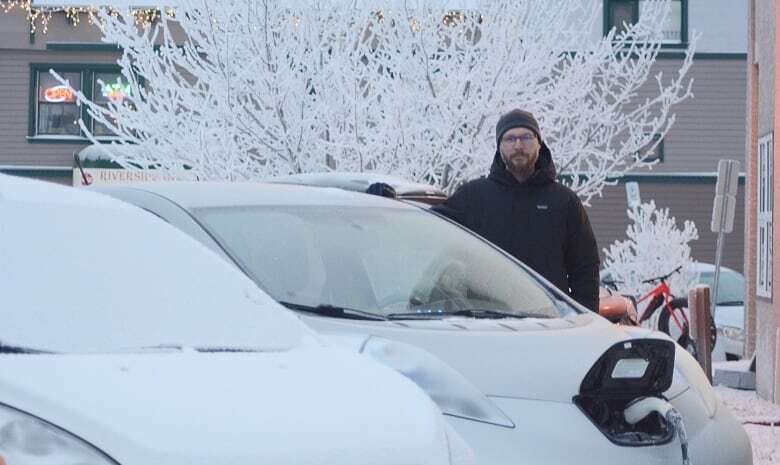 Shane Andre has been driving a 2012 Nissan Leaf he bought second-hand in Vancouver. The electric car has a shorter range than a Tesla, but provides enough power for his needs, which are about 40 kilometres a day in total. The total range in winter is about 80 kilometres, he said. The manufacturer estimates the car's range to be about 120 kilometres. So while "you might not go out to the hot springs on a cold day," he said it is a reliable commuter. "I do have to drive it every day. It needs to be able to get me to work and I need to be able to pick up my kids from school," he said. Andre parks the car outside overnight. "It starts fine. As long as it's plugged in overnight, it'll charge the battery. I also have a timer that warms up the interior of the car before I leave, so it's nice and toasty." The Yukon government also has an electric vehicle — a 2016 Chevrolet Spark EV used for short-distance trips within Whitehorse. That vehicle is still considered a pilot project and is shared between employees with the Climate Change Secretariat and the Energy Solutions Centre, part of the Yukon government's Department of Energy. Andre directs the Energy Solutions Centre and said the vehicle works well in Whitehorse. However, he said it is a first-generation vehicle. "We took it to Carcross for work on one occasion and made it — but we were nervous on the way back," he said with a laugh. Carcross is 72 kilometres away. About 12 fully electric vehicles are registered in Yukon. The territory has two public charging stations. One is at the Yukon Transportation Museum and the other at the Mount Lorne community recycling centre. The territory also has 105 registered hybrids. Gordon and Corliss Gilgan live in Whitehorse and bought a 2018 Toyota Prius Prime hybrid in the fall. That car offers a 40 kilometre range for the electric battery without the aid of a hybrid gasoline engine. However, Gordon said that's enough. The retired couple live less than 10 kilometres from the city's centre. Gordon said they bought the car in October. "We've driven the car just over 1,600 kilometres and we've put no gas in it," he said. The couple has been finding ways to preserve their batteries. That includes using the onboard heat conservatively. "Because we're travelling in the winter, we always wear outdoor clothing. There's no need to heat the cabin to room temperature. All we need is to make sure the windows are clear for winter driving. The heated seats and steering wheel do make it comfortable for winter driving," said Gilgan. Two hurdles for electric vehicles in Yukon will be heavier vehicles and longer distances. The majority of vehicles in the territory are trucks, and there are no electric truck options on the market at this time. As well, some communities, like Dawson City and Whitehorse, are separated by more distance than even the most-capable battery will allow in one charge.